Sprinkle chicken with 1/4 teaspoon pepper and salt. Combine cheese and cream cheese in a bowl. Combine the remaining 1/4 teaspoon pepper with breadcrumbs, parsley (or thyme) and 2 teaspoons olive oil in another bowl. Heat the remaining 2 teaspoons olive oil in a large, ovenproof non-stick skillet over medium heat. Cook the chicken until browned on both sides, about 2 minutes per side. Move the chicken to the center so all pieces are touching. Spread with the cheese mixture, sprinkle with ham, then top with the breadcrumb mixture. Bake until the chicken is no longer pink in the center and an instant-read thermometer registers 165° F (75° C), 5 to 7 minutes. Note: serve with delicata squash and broccoli. 638 members have added this recipe to their cookbook. This was very good and did not take long to make. The pieces of chicken I used were thick and I had to bake it for about 20-25 minutes to get the chicken to cook through. Next time I will cut the chicken thinner. I had this with mixed veggies, although I bet it would be even better with asparagus. I am on the WW PointsPlus diet. The recipe makes 4 servings and is 8 points per serving. Delicious and very satisfying. I served it with asparagus and a green salad. I made this recipe as listed. I will make this again and again. It is wonderful and hearty. I served it with steamed veggies. My whole family loved the yummy chicken! 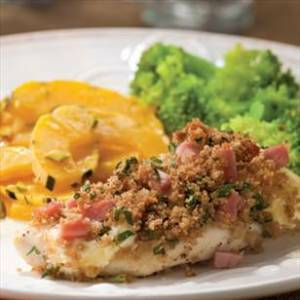 There are 259 calories in 1 serving of Quick Chicken Cordon Bleu. Calorie break-down: 45% fat, 10% carbs, 46% protein.